The Lembeh Straits is quickly becoming a big favorite with diving enthusiasts. The sea bed of the strait is mostly covered in black sand, and the diving style is most commonly referred to as "muck diving". At Lembeh, it's all about the small stuff. There are around nine dive resorts spread out along both sides of the strait. For my first trip there, I was graciously hosted by Two Fish Divers. 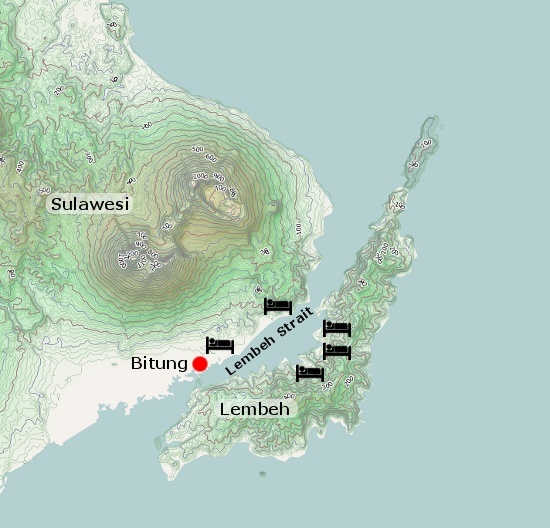 As of February 2010, all divers in the Lembeh Strait must pay a one-time entrance fee of 50,000 Rupiah (about US$ 5). For this fee, you receive a tag you can fix to your BCD, which is valid for the full calendar year in which it is purchased.